A vineyard made for Pinot Noir. This Sonoma Coast vineyard was developed specically with Pinot Noir in mind. Bold sweeping elevation changes and clonal selections define this exemplary property which is farmed to exacting standards. 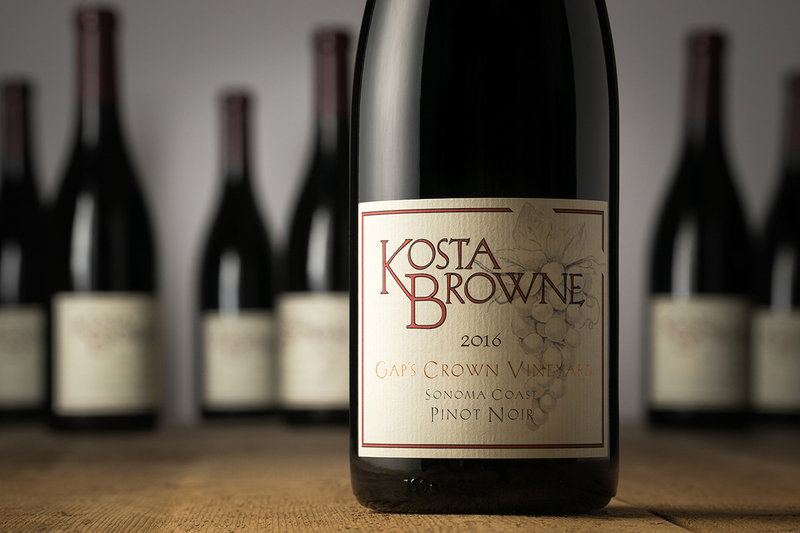 For us, Gap’s Crown is all about a professional singular focus on Pinot Noir and we love it. Steep hillsides and a variety of clones help add diversity to this vineyard whose aspects were carefully planted to encourage even sunlight exposure during the final stages of fruit ripening. The Sonoma Coast influence is key for Gap’s Crown – located in the Petaluma Gap where late season fog becomes trapped and takes longer to burn off. The fruit is allowed to hang a little longer creating more balanced and evolved flavors. We’ve been working with the vineyard since 2006 and enjoy a long-term lease on 37 acres. This allows us to manage how the vineyard is farmed and exercise our influence as an estate producer. Gap’s Crown has become the backbone of our Sonoma Coast program and we believe the viticultural standards at work here are second to none. Nose: Purple fruit with cherry and raspberry character. Hints of violets on the nose. Mouth: Full body that is very dense with defined layers. Agile and fresh with hints of salt.